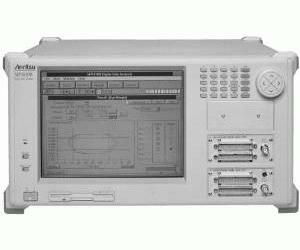 The Anritsu MP1630B is a general-purpose bit error measuring instrument that can provide simultaneous measurements of multi-channel signals and burst signal measurements up to 200 MHz. The MP1630B is not only for continuous signals---it can measure burst-signal bit error rates as well. Consequently, it is easily able to handle burst signals used by TDMA (Time Domain Multiplex Access) methods and packet/cell transmissions, etc. Both a pulse pattern generator unit and an error detector unit can be installed in the MP1630B to measure simultaneously parallel data for 16 channels using just one unit.